When is the last time you tried something different with your look? Have you revamped your hairstyle in the last few years? Or have you tried a different kind of nail polish style? Doing new things with our look keeps us excited. It is invigorating to look in the mirror and see yourself looking a bit different. With those four little pigtails divided up evenly, she slathers them in copious amounts of hair gel until they stand on their ends straight up into the air! While that alone might be enough for some people, this stylist is only getting started. She runs her comb through the first pigtail and then starts trimming it. She repeats the process with the next vertical pigtail. After trimming them all to the length she wants, she simply undoes them and fluffs out the girl’s hair. 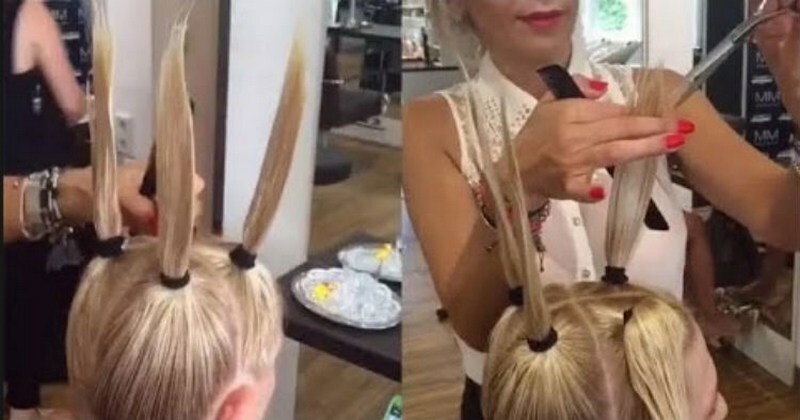 There isn’t anything different about the result but it sure is a baffling procedure for trimming hair evenly. The result of the new trick is a gloriously layered design. Since this video has already gotten nearly 400,000 views, more hair salons around the worlds are probably going to pick it up and start using it themselves.